Combo Cleaner for Mac is an antivirus and free system optimizer created by RCS Software. This application runs on Mac computers and works with all recent Mac operating systems, including Yosemite, El Capitan, and Sierra. This application takes a different approach as compared to traditional antivirus suites. As well as an antivirus function, Combo Cleaner includes a disk cleaner, big files finder, duplicate files finder, privacy scanner, and application uninstaller. This app can be used to clean computers of security threats and free up significant disk space cluttered by redundant files. Although Mac computers are thought to be more secure than Windows systems, a reliable antivirus solution is paramount. Combo Cleaner for Mac is Amazing System Optimizer! How to use? 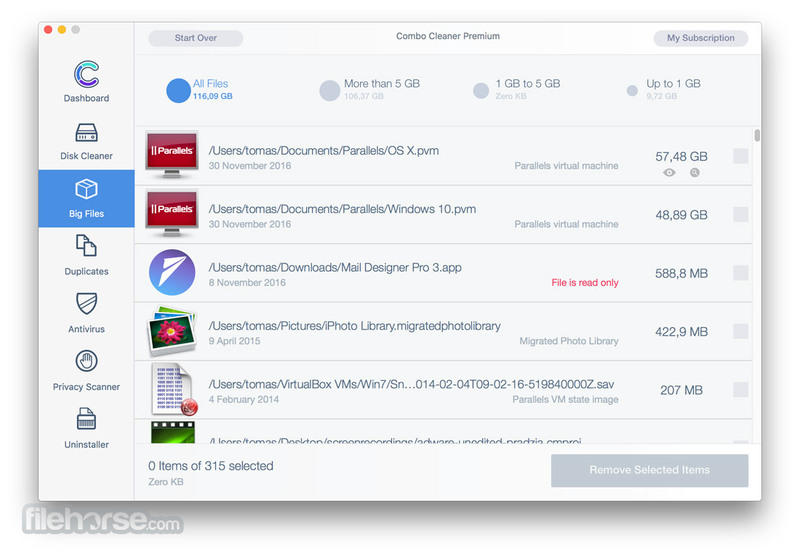 Simply download Combo Cleaner from FileHorse or Mac App Store. After launching the app wait for the antivirus to download the latest virus definition databases and click “Start Combo Scan”. 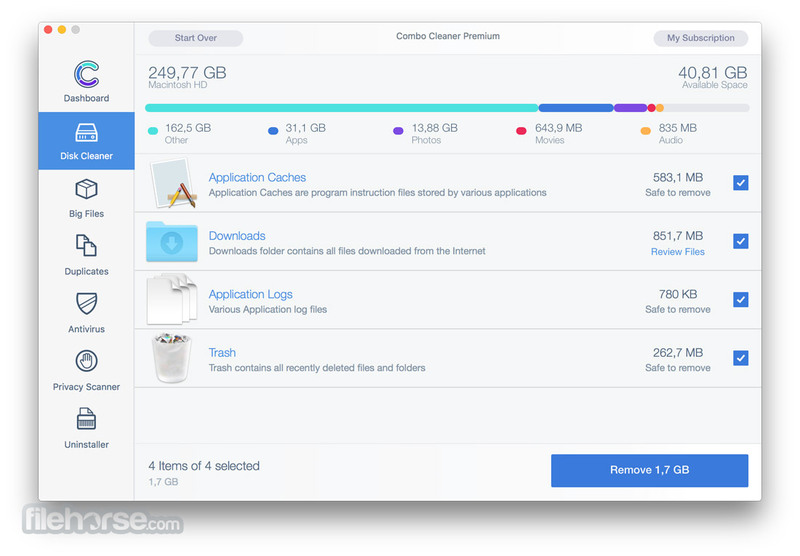 After a couple of moments your will be able to remove tons of useless files and eliminate all security threats that could be present on your Mac. Your Mac is a masterpiece – keep it this way with Combo Cleaner. Professional Mac antivirus with hourly malware and adware definition updates. 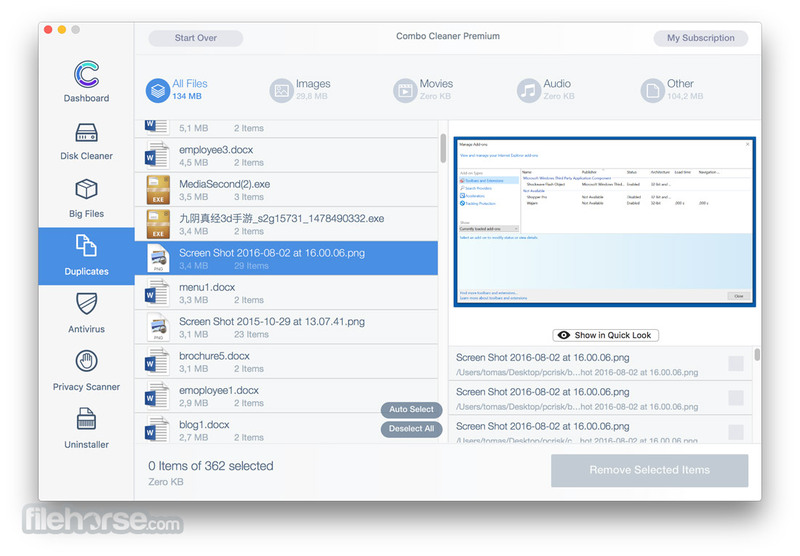 Disk cleaner, big and duplicate files scanner to save gigabytes of valuable disk space. Privacy shield that eliminates various information stored when browsing the Internet. Support staff is ready to answer all of your questions regarding Combo Cleaner 24/7. Combo Cleaner is equipped with an award­ winning virus, malware, and adware scan engine. Duplicate files are identical copies stored in various places on your hard drive. These files are a waste of valuable disk space. Disk Cleaner ensures that your Mac is free of junk and obsolete files that can accumulate megabytes of wasted disk space. Wondering why your disk is full but unable to locate files occupying significant disk space? 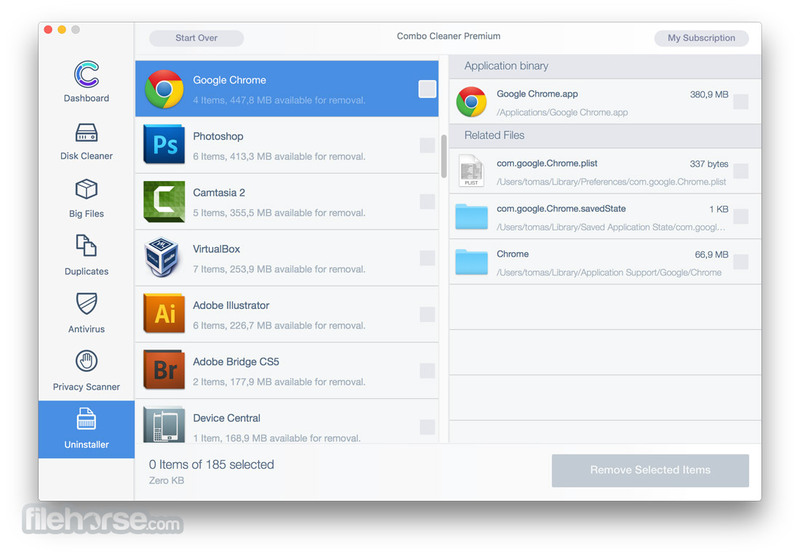 When you remove applications from your Mac, many useless redundant files often remain on the system. Privacy Shield scans installed browsers and enables you to easily remove stored browsing history, cookies, etc.